Carl Zeiss AG, Germany, one of the oldest and most respected camera lens makers in the world, reports in Camera Lens News that it has achieved its highest-ever resolution from a camera lens. Using a production camera and lens, along with special high-resolution SPUR-Orthopan UR film, Zeiss scientists were able to achieve 400 lp/mm on film from a Cosina-made Carl Zeiss ZM-Biogon 25mm ƒ/2.8 lens in ZM (Leica M bayonet) mount, in the center of the image field at ƒ/4. A lens that can resolve 240 lp/mm on film would be considered outstanding. With virtually all camera lenses, common aberrations limit performance at wider apertures. Stopping the lens down reduces the effects and extent of aberrations, but introduces diffraction. By the point where diffraction dominates the degradation of the image, the lens is said to be "diffraction limited." The wider the aperture at which a lens is diffraction limited, the better the lens. Not only is the 25mm ZM-Biogon diffraction limited at a a wide aperture, but the 400 lp/mm achieved by Zeiss is the maximum resolution theoretically possible at ƒ/4. Quite an achievement for a production camera lens. ADDENDUM: Ever the contrarian, the thing I'm most enthused about when shooting with this lens is the totally completely incredibly wonderful finder. How's that? You know, the little viewfinder you clip into the hot shoe, the square bit seen at the top of the picture above. 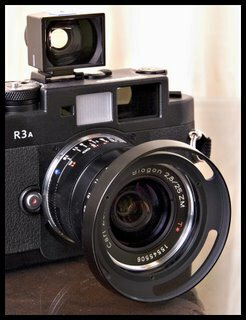 It is without question the best 24/25mm and/or 28mm finder this writer has ever put his jaded eye to. Just a pleasure to look at the world through. Quite addictive. To forestall the inevitable questions, no, you do not need one; yes, other finders work pretty much as well; but no, no other finder I've ever seen for lenses this wide is as clear, bright, clean, and rectilinear as this. With the caveat that it's an extra, highly recommended if you often use a 24mm or 28mm on any 35mm rangefinder camera. Wow! I must get one, it sure will make me the best theoretically possible phographer, at least at f/4! I find it amusing that the Zeiss newsletter says "When digital catches up with film..."
Mike: I had seen this posted on RFF as well. I was amazed that the doubters who had been dissing any Zeiss product not made in Germany as "a Cosina product that won't be a reail Zeiss product" are now strangely quiet. Naturally, any tool which tests so well under limited, controlled conditions is welcome, but Zeiss rightly notes that the tests do not necessarily relate to "real world" shooting situations. So be it, but I welcome the best tools I can get. eolake: Do you REALLY want to start that debate here? "Superior technically" is technically a really, really fuzzy phrase. IOW, what the heck dos "superior technically" mean? And who, exactly, are the top pros? "Do you REALLY want to start that debate here?" Good grief no. I just thought it was amusing. I'm a bit confused by the film type - orthopanchromatic. The data sheet (English version) says the primary use of the film was document copy, where orthochromatic films were once common. Is there a relationship between the wave lengths of visible blue light and "maximum theoretical" resolution? The short answer, Steve, is that many ultra-high-resolution films are ortho copy films developed in very low-activity high-compensation (also called extended range) developers. The practice spread among hobby photographers after Marilyn Levy came up with her POTA developer for Kodak Tech Pan in the 1960s. I believe my technique in the 60's was Kodak SO456 film in a very dilute Tetenal brand developer of some sort (with a snap-off glass top? ), before Tech Pan was labeled as such. While I got a reasonably long tonal range and very fine grain (at unreasonably long developing times! ), I never considered that the spectral sensitivity of the film might be other than panchromatic. Not that it matters : ), but may we presume that a red-blind film would have a practical advantage in such a resolution measurement? I know folks are licking their chops anticipating taking photos of newspapers and usaf targets. All kidding aside, I'm sure the lens is great. I'm a huge biogon fan. I'd love to see some pictures taken with this lens. I know you can't tell much about image quality from images on the screen--I take your word about the quality of the lens--I just like looking at pictures. Bill W.